I was delighted when my friend Autumn asked if I would take photos of her practicing yoga to use in her client newsletters and (someday) website. Bright and early on a Friday morning we headed out to a resplendent Olin Park. Fall in Wisconsin is always a reminder of how incredibly beautiful my home can be. Often I daydream about majestic elegance of France, the sunlight and greenness of northern Italy, the moody hues of the Pacific Northwest. When I look out my window these days, however, I can’t help but catch my breath and be grateful, because I am living in a landscape that shimmers and shines. Thank you Autumn for giving me such a wonderful opportunity- can’t wait to do it again! Autumn’s boyfriend, Reed, joined us. 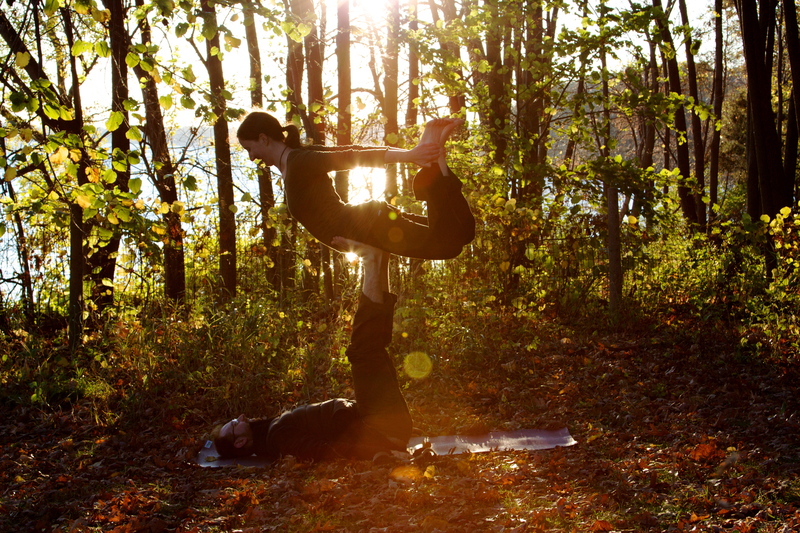 Here he and Autumn are demonstrating AcroYoga, which combines acrobatics with yoga practice. It’s actually how they met (how cute is that?!). Here Autumn is showing her Slacklining skills. 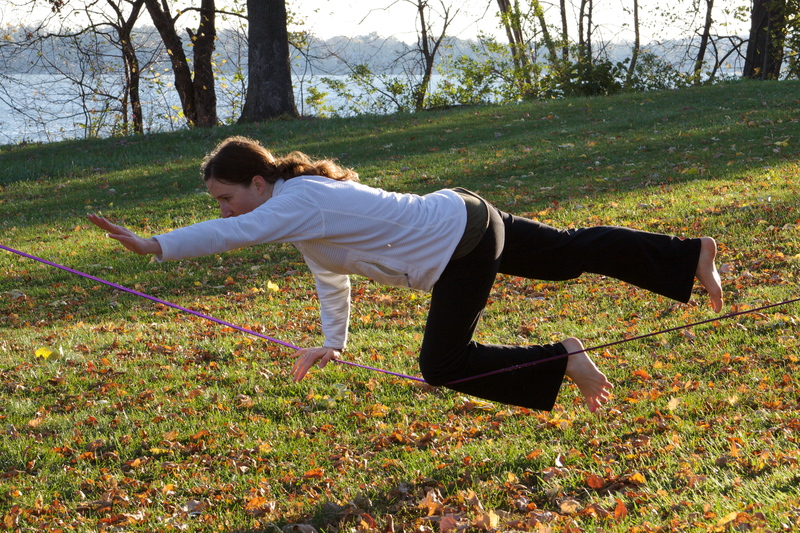 Slacklining is kind of like yoga on a tightrope, but the rope has more give, or “slack”. It’s a great way to improve core strength and balance, which is part of the reason why it ties into a yoga practice so well. If you would like to see the rest of the shots from our morning session, check out my Flickr page. If you are interesting in contacting Autumn about yoga classes, AcroYoga or Slacklining, email her at yogaautumn@gmail.com. 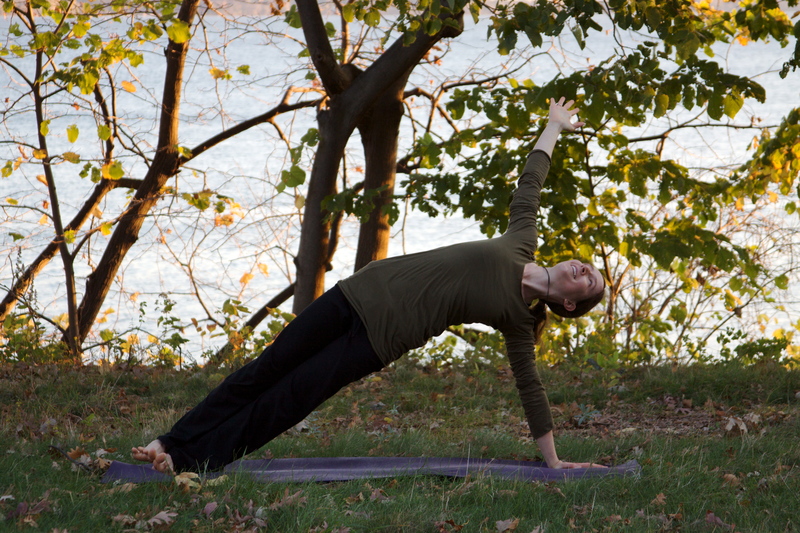 She is currently teaching classes at Mimosa (downtown Madison) and at Boulders Climbing Gym. Thanks for reading. I hope you are all having a lovely day! Wow, that is beautiful. Nice pictures; I am impressed. I have never heard of slacklining before – that must take a lot of concentration and skill.